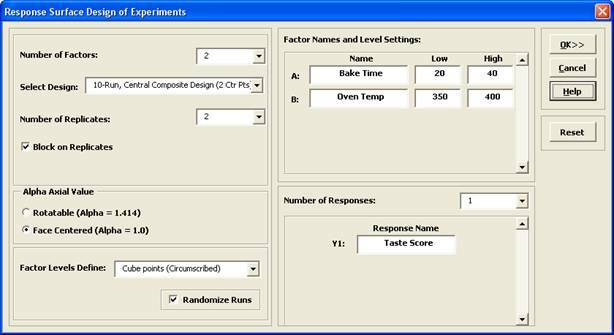 We will illustrate the use of response surface methods using a layer cake baking experiment. The response variable is Taste Score (on a scale of 1-7 where 1 is "awful" and 7 is "delicious"). Average scores for a panel of tasters have been recorded. The X Factors are A: Bake Time (20 to 40 minutes) and B: Oven Temperature (350 to 400 F). The experiment goal is to find the settings that maximize taste score. Other factors such as pan size need to be taken into consideration. In this experiment, these are held constant. 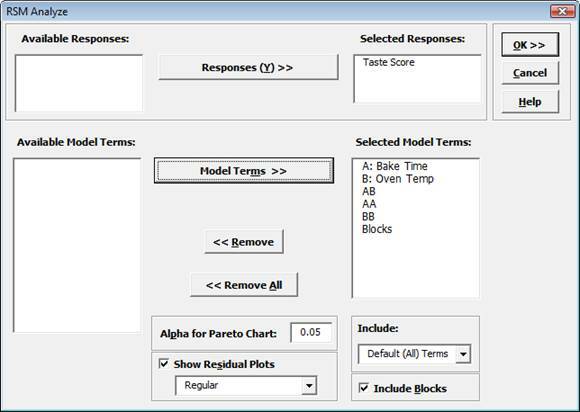 Click SigmaXL > Design of Experiments > Response Surface > Response Surface Designs. The Number of X Factors can be 2 to 5. Select Number of Factors = 2. The available designs are sorted by number of runs. Increasing the number of runs allows for uniform precision or blocking, but we will select the design with fewest runs, the 10-Run, Central Composite Design (2 Ctr Pts). As discussed earlier with the catapult experiment, it is a good practice to replicate an experiment if affordable to do so. Here we will select Number of Replicates = 2 and check Block on Replicates. Blocking on replicates allows us to perform the experiment over a two week period, with each block corresponding to week number. Change the Alpha Axial Value option to Face Centered (Alpha = 1.0). This simplifies the design to a 3 level design, rather than a 5 level design with alpha = 1.414. (The trade-off is that we lose the desirable statistical property of rotatability for prediction). Tip: This alpha is the distance from the center point to the end of the axial (star) point. Do not confuse this with Alpha for Pareto Chart which is the p-value used to determine statistical significance. Unfortunately the term “alpha” has been chosen by statisticians to define two completely different things. 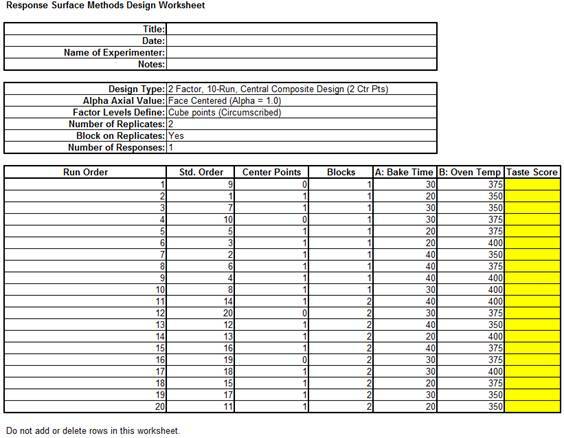 Open the file RSM Example – Cake Bake to obtain response values. 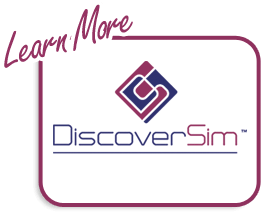 Click SigmaXL > Design of Experiments > Response Surface > Analyze Response Surface Design. 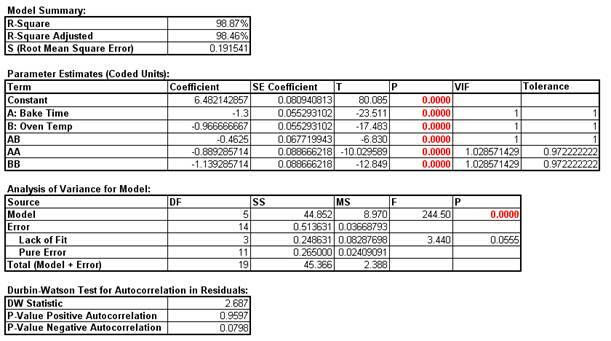 The model looks very good with an R-Square value of 99.09% The standard deviation (experimental error) is only 0.19 on a 1 to 7 taste scale. All of the model terms are statistically significant (P < .05), but the Block term is not, so it should be removed from the model. Note that AA and BB denote the quadratic model terms. 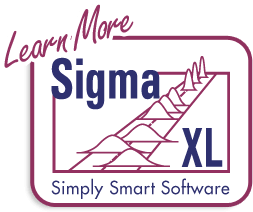 To create a contour and surface plot, click SigmaXL > Design of Experiments > Response Surface > Contour/Surface Plots. Scroll across to the Predicted Response Calculator. Enter the predicted values shown. These initial settings were determined from the contour plot as an estimate to yield a maximum taste score. 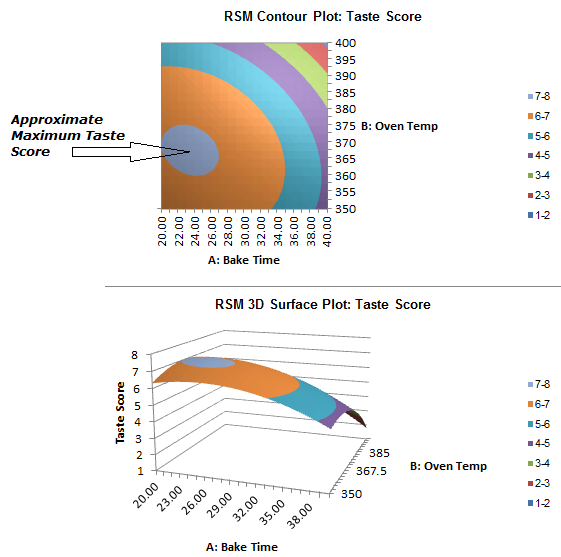 Although the model is predicting values that exceed the maximum taste score of 7, this is expected to give us the best possible settings for cook time and bake temperature. To quote the eminent statistician George Box, “All models are wrong, some are useful”. Additional experimental runs carried out at Time = 23.4 minutes and Temperature = 367.7 F. confirm that these are ideal settings.